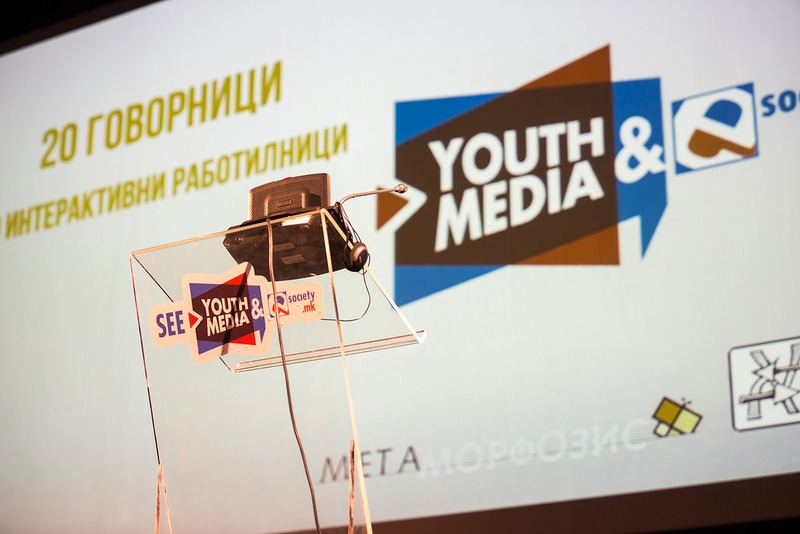 The ninth international “e-Society” conference “Youth and Media” took place in the Youth Cultural Center in Skopje on February 7 and 8, 2014. The two-day conference organized by the Metamorphosis Foundation and the Youth Educational Forum (YEF) addressed a multitude of topics, and more than 40 speakers at the conference challenged the traditional views about the media, shared their experiences and opened a discussion about the media from the perspective of the youth, the youth-led media, media literacy and quality of information, digital media activism, music and movements. The conference was opened by Elena Ignatova from Metamorphosis and Monica Bozinoska from YEF, who presented the results from the several months’ research on youth and media in 11 South-East European countries. Presentations continued on topics like youth, reputation and privacy online, focusing on young people’s views and practices; anonymous reporting on illegal online content, such as abuse of children’s images and hate speech online, fight for digital rights in terms of privacy, freedom of speech, government transparency and efficiency, monitoring and human rights, training for young people to voice their opinions and to provide a critical view of the media and politics through journalist education and learning through practice; strengthen the youth-led media network, youth as creators and participants in the media sphere, enabling citizens to read, write and participate in public life through the media, how to change the local community through photo activism, how to create content according to the web standards, media and information literacy in the schools, media literacy and the quality of information, creating compelling stories with the use of data, tools for youth and activists against hate speech. The presentations were followed by film screenings of Riot from wrong and Sav Taj Folk / All That Folk. The second day ended with a screening of the film “A love letter to the alternative culture” and the film produced by the Balkan Investigative Reporter Network (BIRN) – “The Majority Starts Here”. The conference was finalized with the digital night – a techno music event organized at the Boris Trajkovski sports hall, with performances of DJs Petar Dundov and Alexander Kowalski, as well as Speedy, Goran Kan, Viktor Apostolski and Lazy Kidz Vizualz. A detailed report on the conference will be posted, and in the meantime you can view the galleries with pictures from the first and second day, as well as the videos of the presentations from the first and thesecond conference day.